With Yen Tan's award-winning drama 1985 heading for UK cinemas and VOD on 20th December, the official UK trailer and poster have been unveiled. 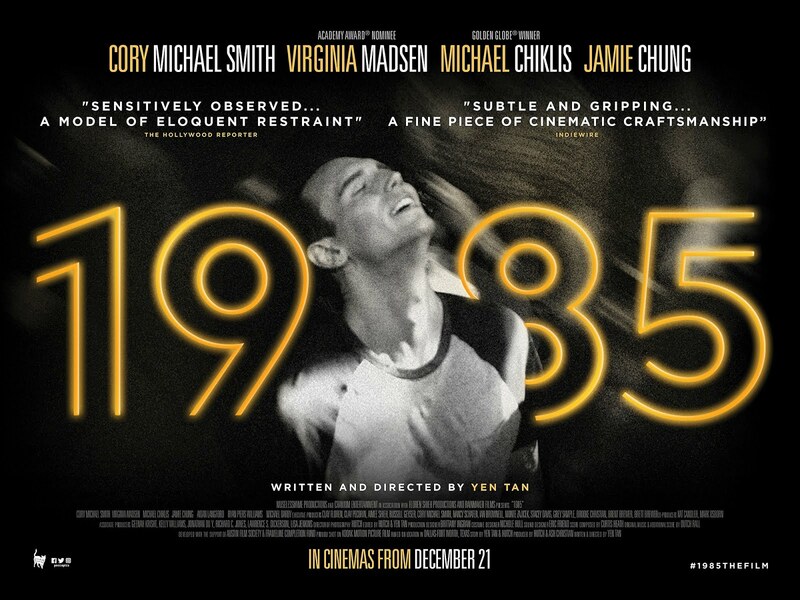 1985, directed by Yen Tan and starring Cory Michael Smith (Gotham, Carol), Virginia Madsen (Sideways; American Gothic); Michael Chilkis (The Shield; American Horror Story); Jamie Chung (The Gifted; Gotham). Texas, Christmas 1985. Adrian (Cory Michael Smith) is home for the first time in a long while. Between is mother's fawning affections, his father's begrudging, stilted conversation and his only brother's cold shoulder, Adrian is all too aware of the impact of his absence had had on them. He is determined to make this visit count, only he knows that the life built in New York City is crumbling apart. Shot on film in atmospheric B&W, 1985 is set at one of the toughest times for the LGBT community during the early days of HIV/ AIDS crisis. As World AIDS Day is poignantly commemorated on 1st December, it's a timely reminder of the ongoing campaign to promote health awareness. Historically, it was the year when the miners supported Gay Pride in UK and when An Early Frost and Buddies were the first Hollywood films to address the growing AIDS crisis. 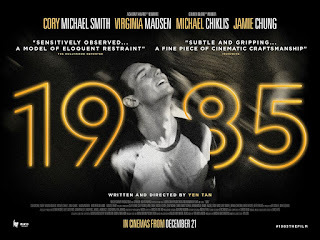 1985 has a bravura ensemble performance from a stellar cast that includes Cory Michael Smith (Gotham, First Man, Carol), Jamie Chung (Gotham, The Gifted), Michael Chiklis (Fantastic Four, American Horror Story, Gotham), Virginia Madsen (Oscar nominated for Sideways) and Bill Heck (The Ballad of Buster Scruggs). The film won two awards at Iris Prize Festival for Best Feature and for Jamie Chung in Best Performance In A Female Role category, with L.A. Outfest awarding Outstanding Screenwriting to Yen Tan. 1985 is going to be a year you will never forget.